Photos of the day - join our Flickr group and add yours! Birding enthusiasts are invited to join the Nokesville Christmas Bird Count (CBC), sponsored by Prince William Conservation Alliance. Everyone is welcome! » Join a survey team to identify and count birds in the field (beginning birders welcome). » Prepare/serve food to hungry birders at the Merrimac Farm Stone House. 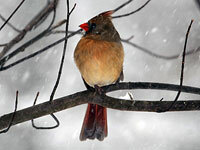 This is a great opportunity to meet the remarkable variety of birds that spend the winter in Northern Virginia. Please join us for a fun, rewarding day and be a part of the oldest and largest citizen science project in the world. Thanks to the 50 people who volunteered their time and expertise, the Nokesville Christmas Bird Count was a huge success again this year. We saw a good variety of birds, a total of 89 species and 19,302 individuals. We added three species to the Nokesville list: a Common Yellowthroat at the Cedar Run Wetland Bank in Fauquier, a Palm Warbler, and a Canvasback seen at MCB Quantico. Birders saw two Barn Owls in Nokesville and the team at Quantico saw two Barred Owls. A screech owl was seen at the Cedar Run Wetland Bank in Nokesville. There was a Pine Warbler at a Fauquier County wetland bank, seen only once before since the start of the count in 2008. At the Foggy Bottom Wetland Bank in Nokesville, birders spotted two Snow Goose, which also have been seen only once before. They saw eight Cormorants fly over and got the only Belted Kingfisher and Gray Catbird of the day. Red-headed Woodpeckers were seen in Quantico and at the Cedar Run Wetland Bank in Nokesville. Overall, there appear to be several high counts, including for Turkey Vulture, Ring-billed Gull, Laughing Gull, American Robin, and Eastern Meadowlark, most of which were seen by Dave Govani's group which also saw 2,000 Red-wing Blackbirds, nearly matching the all time high by themselves. 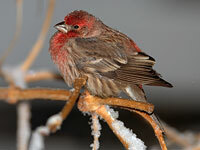 Now in its 116th year, the Christmas Bird Count (CBC) is the oldest and largest citizen science event in existence. The National Audubon Society leads the effort, compiles data nationwide and makes the results available to all on their website here. All CBC Circles cover a 15-mile diameter circle (113,000 acres). The information collected by citizen scientists provides a snapshot showing what birds were found on one particular winter day over many years. The Nokesville count circle, centered at Merrimac Farm WMA, covers a diverse landscape at the edge of the Baltimore-Washington metropolitan area and captures the transition from coastal plain to piedmont ecosystems. It extends from the Prince William County landfill on Route 234 to Nokesville Proper, and from the Lunga Reservoir near I-95 to Catlett in Fauquier County. 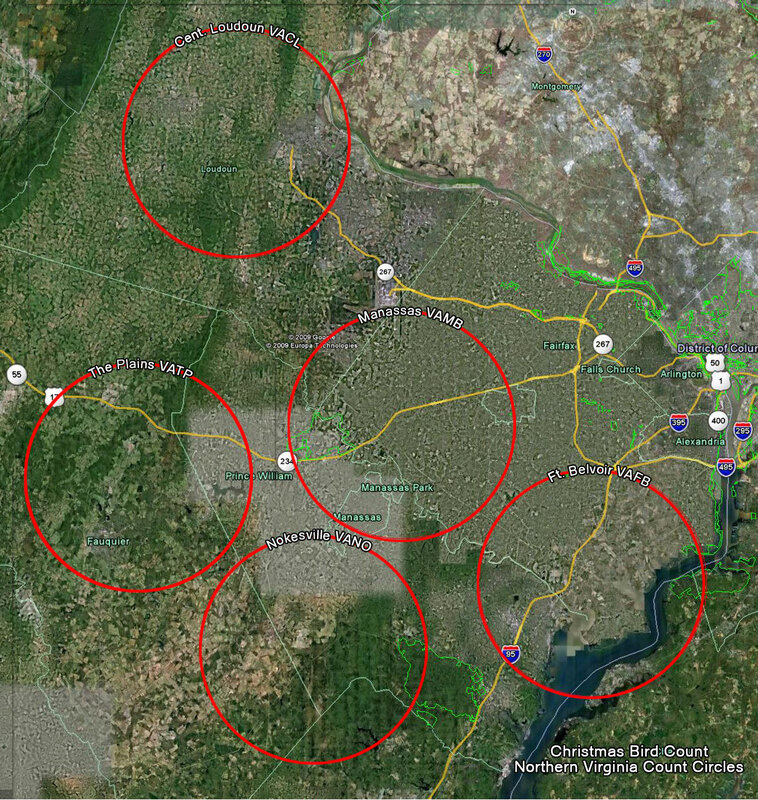 The count circle includes portions of Prince William Forest Park, Manassas Airport and large areas within MCB Quantico. Parks and conservation areas include Merrimac Farm, the Cedar Run Wetland Bank, Foggy Bottom Wetland Bank, Nokesville Park, Brentsville Courthouse, Bristoe Battlefield Park and Hellwig Park. 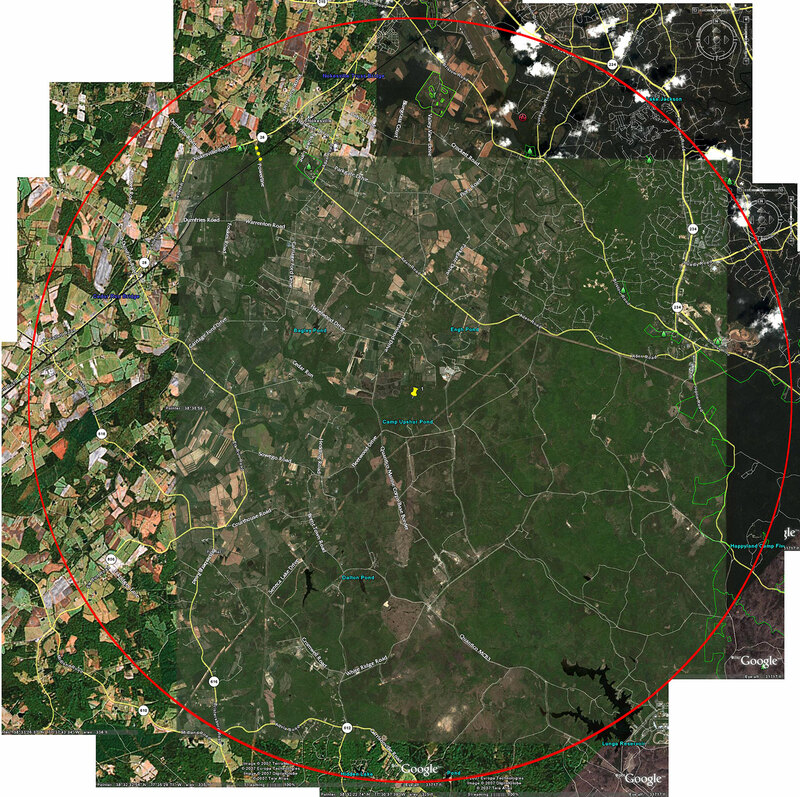 The count circle covers part of Prince William's Rural Crescent, where 10-acre subdivisions, small farms and private ponds of all sizes are common. In Fauquier, birders survey small hamlets along Elk Run Road and near Bristersburg, as well as most of Catlett, and Calverton. Birders saw clear skies and calm winds, with temperatures ranging from 20 degrees in the morning to a high of nearly 50 degrees. Together volunteers identified 90 different species of birds and nearly 13,000 individuals. Highlights of the day included American Tree Sparrows and a surprise showing of Evening Grosbeaks at the Foggy Bottom Wetland. Fourteen Northern Shovelers were visiting a private pond in Nokesville and two Screech Owls were spotted near Bristow Road. At Quantico, there was a solitary Common Loon and Red-headed Woodpeckers, which were also seen at the Cedar Run Wetland Bank. Common Ravens were at the Cedar Run Wetland Bank and four Brewer’s Blackbirds at a farm near Merrimac Farm Wildlife Management Area. In Fauquier County, birders were excited to see 32 Horned Lark and 12 Rusty Blackbirds. Traditionally the Prince William County Landfill has the largest numbers of Bald Eagles and this year was no different. Birders counted 10 adults and 10 immature Bald Eagles, along with many gulls including 650 Ring-billed Gulls and three Great Black-backed Gulls. European Starlings were by far the winner for the most individuals, with more than 2,300 included in the count. Canada Geese were also well represented, with more than 1,400 individuals, and we recorded more than 1,000 Ring-billed Gulls. Warmer than previous years, temperatures ranged from under 30°F in the morning to nearly 50°F after midday. More than 30 people helped make this count a fun and memorable experience. Together we tallied 81 species. 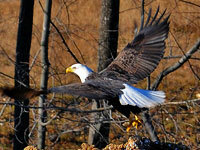 Highlights of the day include 12 bald eagles seen at the Prince William County landfill. The Bald Eagles were watching/hunting the 1000+ gulls, mostly ring-billed, foraging through uncovered trash. One Raven was also seen at the landfill, with 2 others at MCB Quantico and 2 in Fauquier County. A Screech Owl was in Fauquier County along with Barred Owls, which were also seen at Merrimac Farm. Woodcock were seen at MCB Quantico and in Fauquier County. 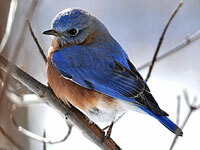 There were many Eastern Bluebirds, with an impressive flock of 50+ at the Rte 234 Wetland Mitigation Area. Foggy Bottom Wetland was the only place Tree Sparrows were seen, for the 2nd year in a row. It was also produced the only sighting of Fox Sparrow. Savannah Sparrows were spotted at Merrimac Farm and in Fauquier County. Merrimac Farm added Chipping Sparrow, Wild Turkey and Brown Thrasher to the list. It was a tough day for birds and birders, cold with steady winds gusting to 30+ mph. But despite the wind and mostly frozen ponds, 26 people sighted 85 species at the Nokesville CBC. Highlights of the day include an immature Golden Eagle at MCB Quantico, and Brewer's Blackbirds at a dairy farm on Fleetwood Drive, near the intersection with Aden Road. Owls included a Great Horned Owl, Short-eared Owl on Parkgate Road, Eastern Screech Owl at Prince William Forest Park, and Barred Owls at MCB Quantico and Fauquier County. A Merlin was seen at the Rte. 234 Wetland Mitigation Area. There was a Yellow-breasted Chat at the Kelly Leadership Center and a Ring-necked Pheasant was spotted near the Cedar Run Wetland Bank, likely escaped from a nearby hunting preserve. We had just one Winter Wren, found at Merrimac Farm, and one Purple Finch, spotted in Fauquier County. American Tree Sparrows and a Meadowlark were at the Foggy Bottom Wetland Bank. There were many White-throated Sparrows, especially in the wetland areas clustered near Cedar Run and MCB Quantico. Wilson's Snipe were seen at two locations and it was good to see Northern Bobwhite on the list after two years with none. Despite some morning fog, flooded creeks and frozen ponds, it was a beautiful day and the weather was more cooperative than what could have been, especially considering the recent snow. In the afternoon, temperatures rose to the mid-40's, but most ponds were frozen and waterfowl sightings were few and far between. Twenty-two people participated and together recorded 84 species and 36,709 individuals. This year the count benefited from considerably better coverage in the Fauquier portions than previous years, which added three species to the list - Wilson's Snipe, Purple Finch and Loggerhead Shrike. We saw Red-headed Woodpeckers at four locations - Merrimac Farm WMA, Cedar Run Wetland Bank, Foggy Bottom Wetland Bank and in a narrow tree line along Deepwood Lane. Other notable species include a variety of owls - Saw-whet, Screech, Barn, Barred and Great-horned - as well as a Merlin, Lesser Black-backed Gull, Horned Larks, and American Pipit. 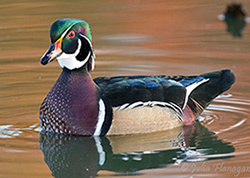 The Cedar Run Wetland Bank produced the count's only Northern Bobwhite and a lone Coot was spotted among a large flock of Mallards in a pond off Wright Lane in Nokesville. Despite the many Wild Turkey tracks in the snow at Merrimac Farm, no actual birds were seen and the only one recorded was near Manassas Airport. Highlights of the count included screech owls at Prince William Forest Park (PWFP) with barn owls, barred owls and great horned owls elsewhere in the count area. There was a woodcock on Parkgate Drive, as well as a cackling goose and meadowlarks. We saw ravens at both the landfill and Victory Lake, rusty blackbirds at the Cedar Run Wetland Bank, and pine siskins at PWFP and the Cedar Run Wetland Bank. The Route 234 wetland mitigation area added a merlin and tree sparrow to the list. It was 6:30 a.m. and the temperature was 13° when 22 people gathered at Merrimac Farm to begin the Christmas Bird Count for Nokesville, Virginia. Neither cold nor gloom of night stayed these committed citizen scientists from helping complete this important national survey. At the end of the day, volunteers observed and recorded 15,873 individual birds representing 82 different species for the Nokesville Circle (survey area). Click here to view the data collected on January 4, 2008.
Notable sightings included Red-Breasted Nuthatches and Bald Eagles at several locations as well as a Northern Harrier at the Cedar Run Wetland Bank, Wild Turkeys at Merrimac Farm and Red-headed Woodpeckers at Quantico Marine Corps Base. Gadwall, Green-winged Teal, and Hooded Mergansers were spotted near the airport and American Woodcock on Parkgate Rd. before dawn.